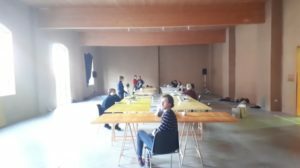 Awareness, responsibility, autonomy: these are some of the key points on which the ‘Cittadellarte & ArtEZ Residence Programme’ is centred, a residency programme for 4th year students of the course of Visual Arts of Arnhem Art Academy. The project, involving twelve students from 20 to 28 years old, represents both an opportunity for personal growth (they are all at their first artistic residency and ten of them are in their last year of the bachelor’s in visual arts) and an extraordinary educational instrument. A project lasting over a month, in which the students organize their time and work in autonomy, experimenting with self-management and the responsibility of artistic research. Specifically, each resident has at their disposal an individual space in which to develop their personal work, but there will be moments of collective debate and dialogue between participants, tutors and UNIDEE staff, and also of interaction with other projects: the artist Nico Angiuli, for example, is currently working at Cittadellarte: the shooting of his film ‘The Human Tools’ is drawing to an end. The students’ ‘headquarters’ are in Sala Cervo, set up like studios and working space, but they will have access to other key areas of the Fondazione, like the library, the UNIDEE spaces and the woodworking workshop. What’s behind the scenes of the organization of the residency? 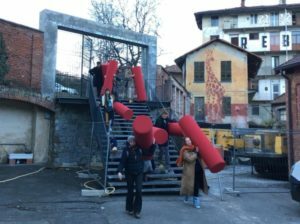 On one side is Cittadellarte’s project to establish an academy focusing on social transformation; on the other, the relationship between Fondazione Pistoletto and ArtEZ, and in particular BEAR, the most innovative bachelor’s course in visual arts in The Netherlands. Cittadellarte has been collaborating with ArtEZ for over a year: the objective is not only to develop common educational projects like the one in progress or the one held last September/October (in which about twenty students worked on the theme of socially engaged art), but also to build an actual shared international bachelor’s course. Michele Cerruti But (coordinator of the project and of Cittadellarte’s programme of High Education) has talked to us about the contents and the programme of the residency: “Even if in the course of these weeks students will be experimenting with autonomy, they are not going to be alone: Sala Cervo has in fact been designated as a collective space where they will all be operating together, facilitating a mutual assimilation”. How do you combine autonomy and self-management of research with a collective collaboration? “There are no plans of specific group projects, – explains Cerruti But – but sharing the same space will allow them to interact with each other on a daily basis. The set up of the studios is in this sense revealing: we have given them the opportunity to arrange tables and chairs the way they preferred, creating a situation in which they had to negotiate among themselves. The interesting thing is that without being suggested it, they all composed a single big table, rather than each creating their own little corner. It’ll be nice to see how the space will change throughout the residency, but this shows that sharing the same space is in itself a way to experiment with the relationship between autonomy and group.